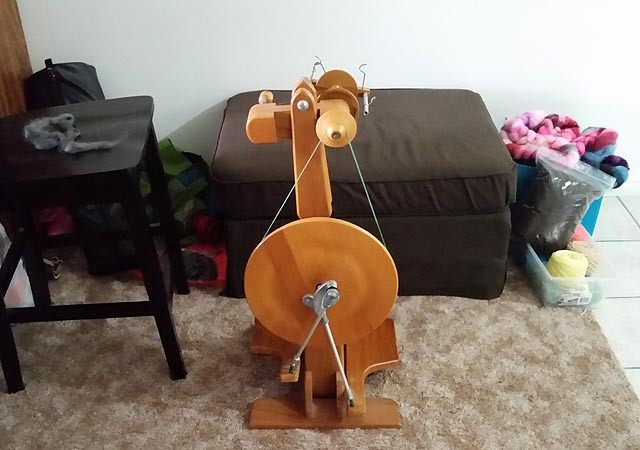 Kit decided it was high time I learned to spin with a wheel and not just a hand spindle, so she let me borrow one of her spinning wheels. Here is the lovely darling and my spinning space, with the overflowing pile of roving to the right side of the ottoman and the chair on the left holding the roving I'm actively spinning. Here are some of the results of my experimenting. A pigtail from Greenwood Fiberworks in American Diner plied in on itself. Next to another single in Leaf, same shop. And I couldn't resist plying them together to create this! I call it Joker. And a bamboo silk in silver that I am currently working on.